SONC offers three different types of competition: individual skills, short court match play and full court match play. Individual skills competition allows Special Olympics athletes to develop sport skills in a competitive format designed to serve as a stepping stone to match play. The individual skills offered for tennis are forehand and backhand volley, forehand and backhand groundstrokes, deuce and advantage court serves, and alternating groundstrokes with movement. Individual Skills uses the red felt tennis ball. Please use these diagrams to train your athletes. Short court match play is very similar to the USTA quick start tennis. Athletes play on a modified court (within the service boxes), and with the red felt tennis ball that has a lower compression. Athletes may choose to compete in two of three short court match play events which include singles, traditional doubles, or partnered doubles (non-Special Olympics athlete partner of significant tennis ability). Full court match play is played on a full court with traditional tennis balls. Athletes may choose to compete in singles and either traditional doubles or Unified Sports doubles. Level Four Tennis is played on a full court, but is played with a low compression “Green Dot” tennis ball and is designed to provide a transition from Short Court Tennis to Full Court Tennis. Please contact sports@sonc.net if you are interested in providing this opportunity for your athletes. Individual Skills Worksheet – For coaches use only, do not submit with registration. ATANC hosts numerous additional tennis opportunities for athletes throughout the year. Check out the tennis calendar to find upcoming ATANC events. For more information contact Lou Welch at lou@atanc.org. 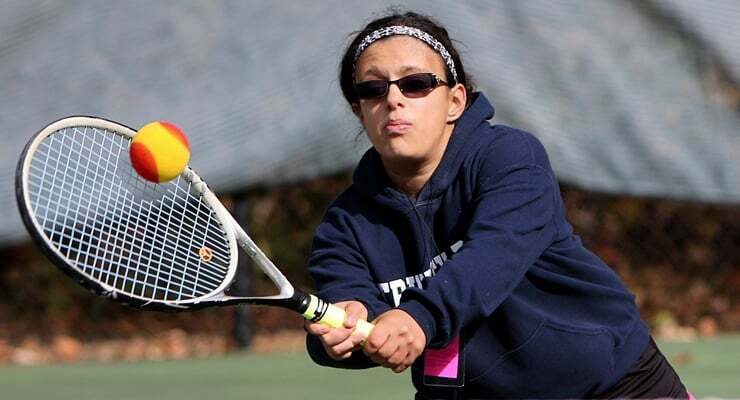 The Special Olympics National Tennis Invitational Tournament is typically held in October of each year. There are also several other competition opportunities for Special Olympics North Carolina athletes that are offered by programs outside of SONC. More information about these events will be posted as it is made available. About Tennis: Tennis is a popular sport played by players of all ages, at all levels of ability. Athletes are trained in all aspects of the game, including stroke production, court craft and the rules of competition. The sport emphasizes values, such as fair play, sportsmanship, and respect for fellow competitors. Tennis is not only fun to play, but it is a lifetime sports activity that is fun to practice and fun to learn. Differences of Special Olympics Tennis: The Special Olympics rules for Tennis provide modifications to control the length of matches through no-add scoring and options for short Sets. More recently, Special Olympics has introduced additional options for shorter courts and low-compression balls for athletes of lower ability. History: Tennis became a statewide SONC sport at the 1986 Summer Games in Charlotte. United States Tennis Association (USTA) teaching professional John Stone began the Special Olympics North Carolina Tennis program in Sanford in 1985. Special Olympics North Carolina was represented by three tennis athletes at the 1991 International Summer Special Olympics Games. Bob Bowler of Mecklenburg county attended as the coach for Team NC. In 1992, tennis moved to the Fall Tournament and except for a two-year stint at the Midsummer Tournament, it has remained a fall sport.